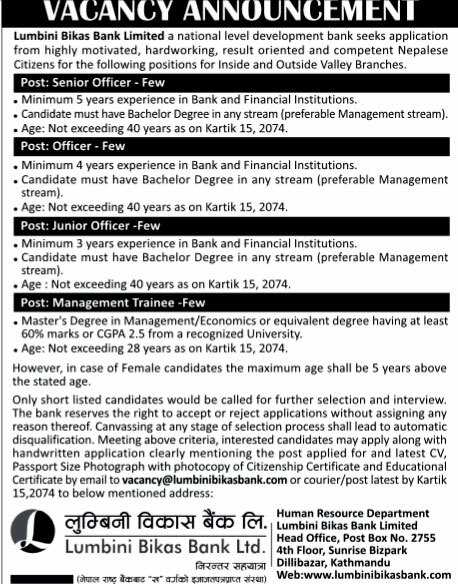 Lumbini Bikas Bank Limited a national level development bank seeks application from highly motivated, hardworking, result oriented and competent Nepalese Citizens for the following positions for Inside and Outside Valley Branches. > Minimum 5 years experience in Bank and Financial Institutions. > Candidate must have Bachelor Degree in any stream (preferable Management stream). > Age: Not exceeding 40 years as on Kartik 15, 2074. > Age : Not exceeding 40 years as on Kartik 15, 2074. > Master’s Degree in Management/Economics or equivalent degree having at least 60% marks or CGPA 2.5 from a recognized University. > Age: Not exceeding 28 years as on Kartik 15, 2074. Previous articleVacancy notice from Deva Bikas Bank Ltd.